I hope you are able to have a better week. I know what it can be like to feel depressed and have to deal with life everyday too. ((((((hugs!)))) making a menu is a great way to get back in the groove!! 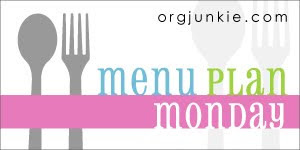 Yay, your menu plan is back. I really do love reading them and getting ideas for my own meals. Hope you are having a good week! Can't wait to see that tatoo all finished!